Solid, compact and effective, the Force USA Leg Extension/Curl Machine is strong enough for gym use, while designed to fit into any home. Featuring SteelForce Structural Integrity and heavy-duty, DuraCore™ high density foam padding wrapped in sewn rip-stop VorTex™ Upholstery, the Force USA Leg Extension/Curl Machine is built to take a pounding. 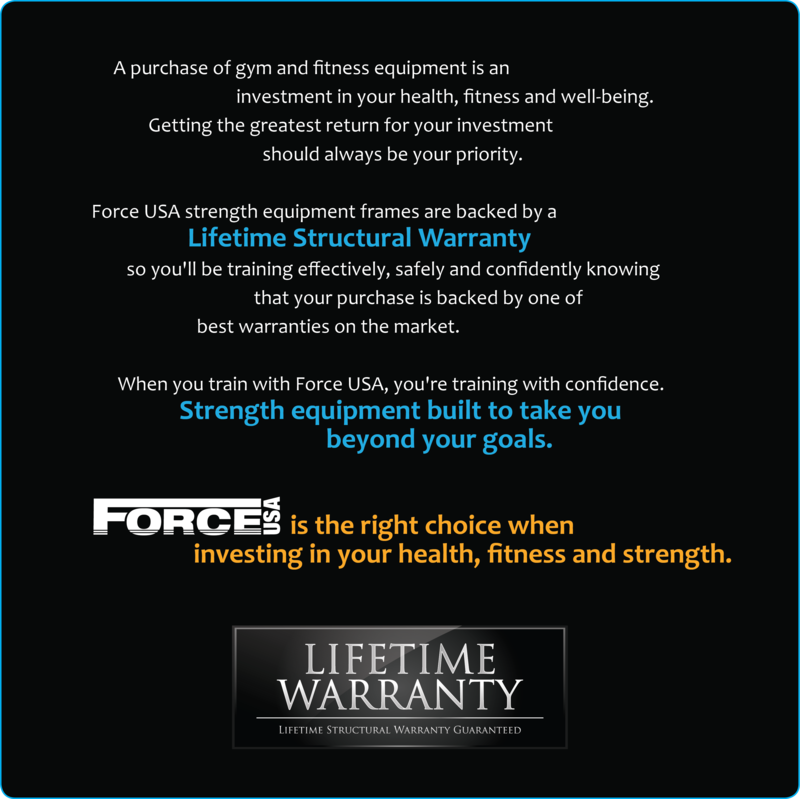 And, with a “Class A” rating, the Force USA Leg Extension/Curl Machine comes with a Lifetime Structural Warranty. 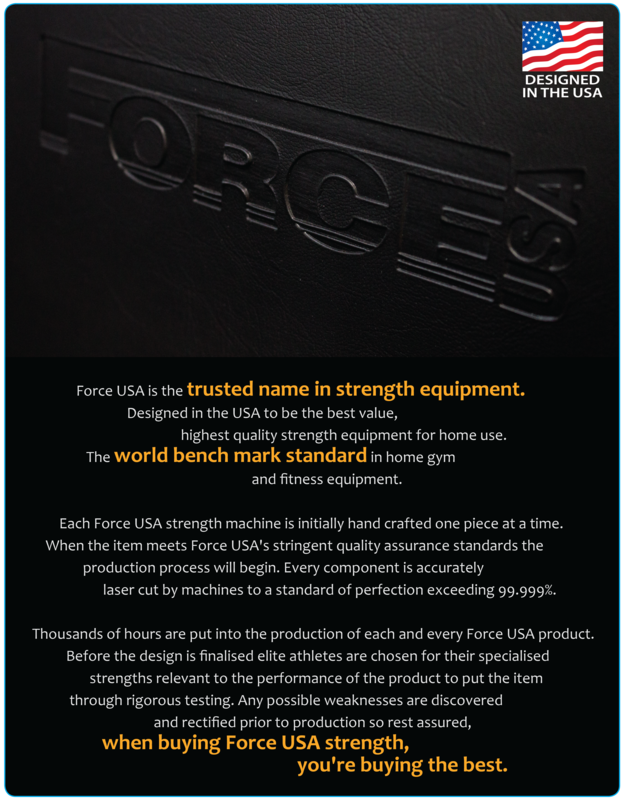 The Force USA Leg Extension/Curl Machine is unmatched in its class and will give you solid and intense workouts for many years to come! The Force USA Leg Extension/Curl Machine will help you build your leg muscles with a huge range of exercises! 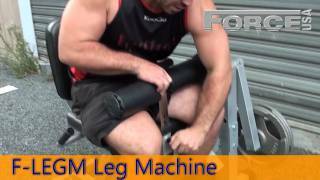 The Force USA Leg Extension/Curl Machine is a must have for any gym. Easy pull pin adjustment to switch from leg extension to leg curls in seconds. Laser cut range-of-motion adjustments enables multiple start positions. Includes a lock catch to enable legs to be locked in place for abdominal workouts. Get a great workout with one of the strongest and most versatile Leg Extension/Curl Machines available. Sewn Seats – Not only do they feature VorTex Upholstery, they look nicer too. Sewn seats are more comfortable and will last longer than vinyl seats that are just stretched or stapled on. Lifetime Structural Replacement Warranty for home use, along with 2 years parts warranty on all cables and pulleys. Delivered in days. Product and service was fantastic.